Comments: The Double Cluster is the common name for the naked-eye open clusters NGC 884 and NGC 869, which are close together in the constellation Perseus. NGC 884 and NGC 869 are at distances of 7600 and 6800 light-years away, respectively, so they are close to one another in space as well. 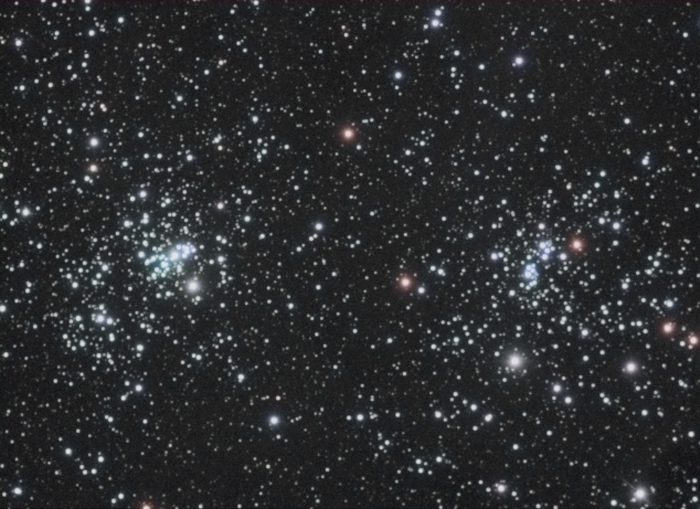 They are relatively young clusters, with NGC 869 5.6 million years and NGC 884 at 3.2 million years. In comparison, the Pleiades have an estimated age ranging from 75 million years to 150 million years.